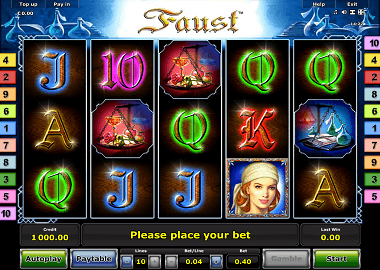 Novomatic’s Faust Slot was released in 2015. Novomatic, which became world famous especially with its Novoline series, is today one of the world leaders in the gambling industry. Online slots such as the Book of Ra or the Dolphins Pearl revolutionized the industry more than 30 years ago. The Faust Online Slot is structurally also from the Novoline Deluxe series. Like its prominent predecessors, the game has 10 paylines on five reels with 3 symbols each. Of course you can also play the Faust Slot here for free. Those who already know other Novoline slots know, that there are no big surprises on many of the slots. Despite the huge competition among the developers of online games, Novomatic remains largely faithful to its simple scheme. The same is true of the Faust Slot: the game offers the usual features and the highlight and a must for big wins is the free spins feature. This is you can trigger with 3 scatter symbols which is also the wild symbol – also an invention of Novomatic. The symbols on the Faust slot are the low-paying cards symbols 10, J, Q, K, and A. Ace and the King will pay the 150x of your line bet if you get a combination of 5 symbols. The theme related symbols are Gretchen, Faust, Mephisto and 2 Scales. The top symbol is of course Faust – here you get the Top Award with a combination of 5 symbols: £250.000! This value can even be exceeded in the Free Spins feature. The minimum bet is £0.10 up to £500 per spin. The free spins on the Faust slot are triggered with the Mephisto symbol. As already mentioned, the Mephisto symbol is also the wild symbol of the slot. So you also get a payout when 2 Mephisto symbols land on your reels. With three Mephisto symbols you get 10 Free Spins. Before the free spins feature starts, a multiplier will be set for your winnings. That way, you can make even bigger profits. We also want to mention that the Faust slot is a high-volatility game. Big profits are rare, but huge if they turn up! The Faust Online Slot and other Novoline games are very rare in online casinos. Greentube is the official distributor of Novomatic online games. Currently you can play Novoline Slots in LVbet, Energy Casino, Video Slots, Guts and Rizk. The best range is offered by the two first mentioned providers LVbet and Energy Casino. For free you can play the Faust slot by clicking on the top banner. You can also find other Novomatic slots and many other top games from manufacturers like Netent, Quickspin or Playn’Go here.